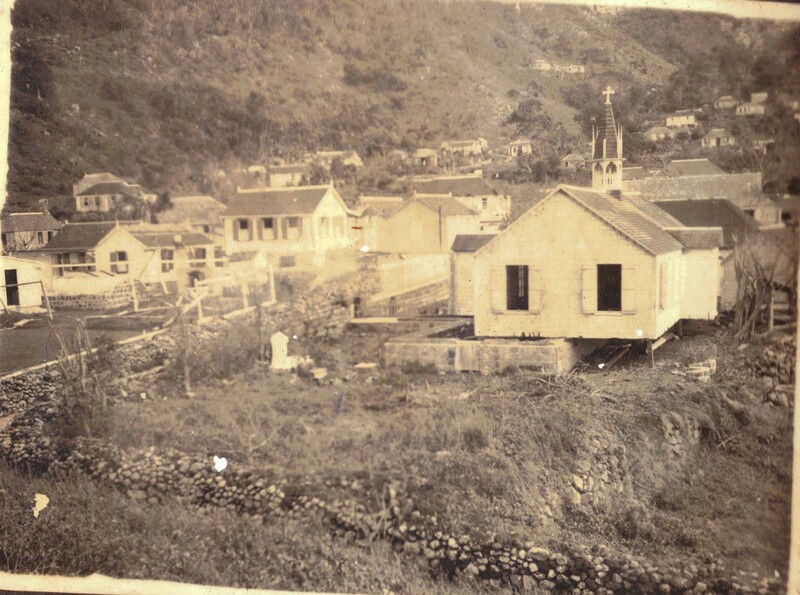 The St. Paul’s Conversion church in Windwardside, the first Roman Catholic church built on Saba in the year 1860. In the photo are Fred Hassell and Peter Every and his wife Lean. The Roman Catholic Church arrived rather late on Saba. In the Spanish period from 1511 until 1648 Saba fell under the bishopric of Puerto Rico. There is no evidence of the Spanish doing anything here as far as settlement of the island and with no settlers it goes without saying that there were no religious activities. In 1665 when the Jamaican pirates from Port Royal captured the island and left many of their men behind, we doubt if they had religion in mind as a safe haven but rather their piratical activities from this new base. The islands’ religions were the Presbyterians under the famous Dr. Hugh Knox (1755 – 1772), and then later on the Church of England which got permission in 1777 to build a church in The Bottom Saba. 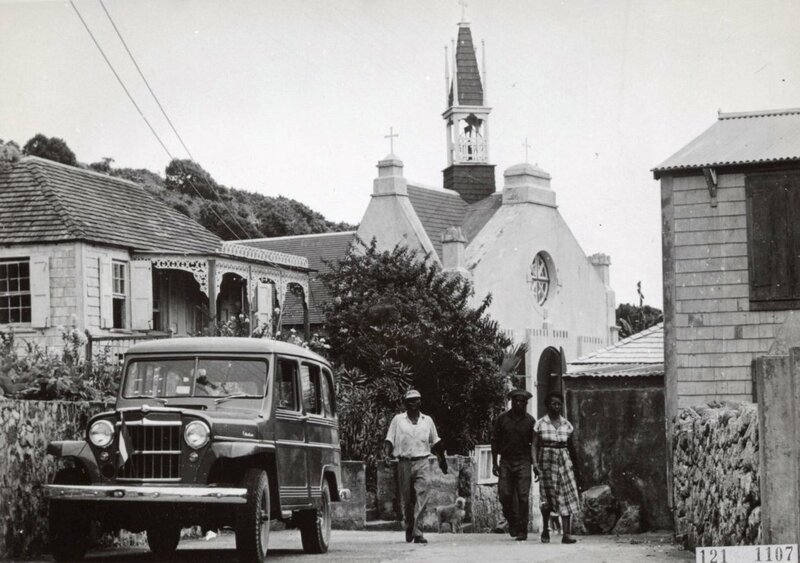 Before that Sabans had been making use of the Dutch Reformed Church on St. Eustatius. The Rev. Anthony Kowan baptized many Sabans between 1709 and 1736, and the Rev. Josiah Jacques was stationed on Saba starting on November 18th, 1736 and remained here for three years. The Dutch Reformed Church never did take hold among the English descended people. The Presbyterian Church of Christ building was located on the grounds of the cemetery behind the World War II monument in The Bottom. The great hurricane of 1772 destroyed it. Also the hill which people call “Paris Hill” was named” Parish Hill” after the Presbyterian Parish church at the foot of the hill. That name of the hill can be found in the old property registers. When the new Anglican Church also “Christ Church” was built the Presbyterian Church members joined the Anglican Church. The first famous Roman Catholic priest and companion of pirates, Pere Labat, visited Saba on Sunday April 17th 1701 and landed at 10 AM. He was received by the Commander Jacob Leverock who invited him for lunch at his home. Father Labat gave a good description of life on the island back then. He was also invited in to the homes of several French refugees. He describes as the main industry that of making shoes. He said he purchased no less than six pair of finely crafted shoes. His schooner also sold some hides to the islanders which Labat had purchased on Cow Island. Father Labat left on Monday afternoon April 18th, 1701. In 1836 Msgr. Martinus Niewindt, the apostolic prefect of the Roman Catholic Church of the Dutch West Indian colony called “Curacao and dependencies”, visited the Windward Islands. Having been on Saint Maarten and St. Eustatius earlier, he now also wished to visit Saba. On none of these three islands was there a priest in 1836. The advent of Roman Catholicism on Saba reads like an adventure novel. When Father Labat was on Saba in 1701 he did not have missionary intentions. Niewindt most certainly did. At the end of May, 1836, he arrived at Ladder Bay accompanied by Manuel Romero, a Venezuelan priest who had come to Curacao a year earlier as a political refugee. Niewindt spoke French and Dutch; Romero spoke only Spanish. The climb to the top led over piles of stone and between steep chasms. Having arrived at The Gap the pair was stared at perplexedly by the Sabans. Communication was not possible. Neither of the two priests spoke English, and the Sabans spoke no French, Spanish or Dutch. Finally a woman from Guadeloupe came forward with whom Niewindt could communicate in French. She led the two priests to the deserted home of an earlier departed Anglican clergyman. On the following day, June 1st, 1836, the first Holy Mass by a Roman Catholic clergyman was said on Saba. Were there people then on Saba who considered themselves Roman Catholic? For more than a century no priest of that religion had been to Saba. Could those present have had the faintest notion of a difference in religion any more than the woman who took Niewindt to the home of the Anglican priest? Niewindt could explain nothing, and the woman from Guadeloupe was not sophisticated enough to understand. Niewindt had brought English catechism books along, and these he liberally distributed. Except for a few, the 1800 inhabitants were illiterate. After the celebration of the Holy Mass the people presented five children to be baptized. Niewindt happily obliged. The first recorded baptism is on June 1st, 1836 and the child was named Simon Peter a natural child of Peggy Dinzey. 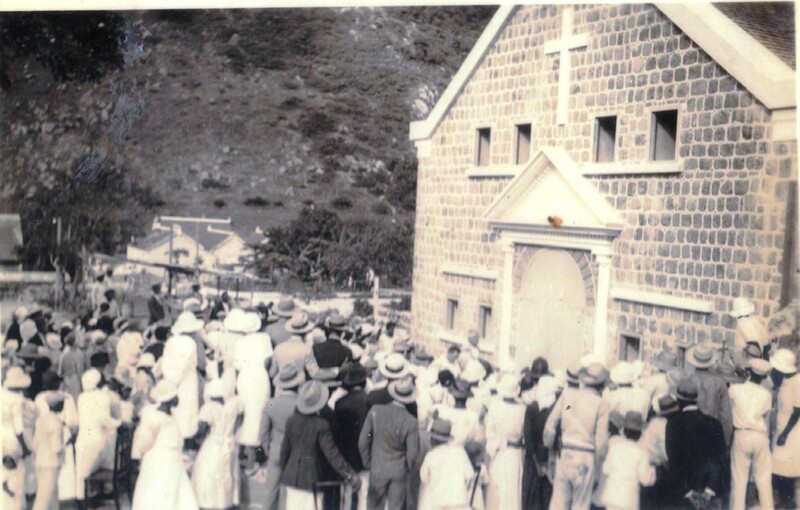 19th March 1935, Dedication of the Sacred Heart Church in The Bottom by Father Norbertus de Groen. After this the two priests set out, supposedly with a guide, along the Western flank of the mountain to Behind The Ridge and to Hell’s Gate which would undoubtedly have been a difficult but fascinating journey. Who could have suggested such a strange route to them? Late in the day Niewindt and Romero arrived at Windwardside where they received shelter in the home of Peter Hassell, an Anglican. Peter was the husband of my great aunt Esther Leverock Johnson. In his home another Holy Mass was celebrated the following day. Niewindt writes that, “Curious girls peeped through the shutters when the ‘new priest’ put on his vestments”. From this one can again conclude that the people simply regarded Niewindt as the successor of the departed Anglican priest. Niewindt could interpret nothing; there was not a single person who understood him. Five years later in 1841 Niewindt succeeded in finding a pastor for St. Eustatius, at that time the most important of the three islands. Just as Saba was partly colonized by the Dutch from St. Eustatius in the 17th century, so it was from there that it received the Roman Catholic Church in the 19th century. Father Joannes F.A. Kistemaker from St. Eustatius visited Saba in 1843 and appointed Miss Sarah Mardenborough to give some religious instruction. Sarah became in fact the founder of this church on Saba and the Ecclesiastical Chronicle also refers to her as Apostola Sabae. She was born on Saba on February 19th 1824 as Sarah Catherine and baptized by Father Kistemaker on June 22nd, 1850. Her parents were Christopher and Maria Mardenborough-Hassell. For 29 years she gave religious instruction, and, after 1854 when a resident priest came, she served as assistant to each succeeding priest until 1873. She taught the youth, took care of the churches, and nursed the sick. As a result of the last mentioned occupation she contracted leprosy. Even then she had the children gather around her bed to prepare them for first Holy Communion. Each year on Maundy Thursday she had herself taken to the church where she spent the night and remained until the ceremonies of Good Friday. In 1903 on December 19th at the age of 79 this remarkable woman died and was buried in Windwardside. In 1873 her work was taken over by Gertrude Johnson-Hassell who was a trained teacher. She taught in a private house. She is also the one credited with introducing the “Spanish Work” or Saba Lace to the women of the island. In 1898 a house was bought and used as school. Saba had other dedicated women to the Catholic faith. Mary Jane Johnson worked in Hell’s Gate and Ann Elizabeth Johnson (Miss Sheshe) did ecclesiastical work from 1858 until her death at the age of 93. She was my great aunt and I sleep in one of her four poster beds. On a small island history has its personal side as well and is therefore interesting to me. Roman Catholic church on Hell’s Gate built 1911. A new stone church was dedicated on this same location in 1962 by Bishop Holterman. In 1850 the Catholic Mission (Prefecture of Curacao) bought a house at Windwardside to be used as a rest house and oratory. At that time the Anglican community had realized that Niewindt and his successors were not of their church. In those days with no politics the churches were at each other’s throats like differing political parties of modern times. A house that had been used by the church and which belonged to a converted Anglican, on his death, was inherited by a “Protestant” who after a barrage of rocks had been thrown at the house while Mass was being held, gave the Priest Father Gast a few hours to vacate the house as who knows it may have been torched. Families were torn apart with all the conversions going on. The Roman Catholic priest is claimed to have gotten no less than 90 converts in the week after the great earthquake of 1857 by telling the people that more would follow if they did not come back to the “true faith”. I heard this story from John William “Willie” Johnson who had heard it most probably from our great aunt Miss Sheshe. So I decided to check the baptismal records for 1857 and came up with 103 baptisms for that year. The largest number for those years and so once again you cannot discount oral history. This earthquake caused rifts in the earth and gasses escaped. Saba was no stranger to earthquakes back then. On February 8th, 1843 there was a serious earthquake with aftershocks the following days. I have an article from the New York Times of 1867 describing an earthquake on Saba and its consequences but that and other stories of natural disasters will have to wait for now. Bishop Verriets visit to Saba in 1933. 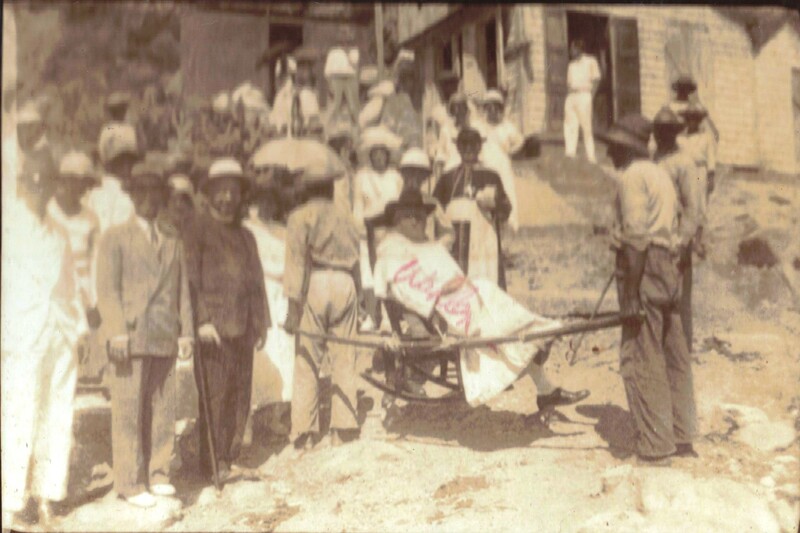 Father Wahlen is being transported in a unique Saba contraption consisting of a rocking chair and with poles strapped to it and four men taking turns to carry the corpulent priest up the old stone steps to The Bottom which is 900 feet above sea level. The costs for such a ride was forty guilders, not an insignificant sum for those days. Father Lawrence Mulder buried together with his colleague Father J. Kock in the vault of the Hassell family in the yard of the R.C. Church in Windwardside. In 1860 the Church of the Conversion of St. Paul was built in Windwardside. The plot of land had been the quarantine station for new arrivals to the island and belonged to Peter Hassell and his wife Esther Johnson my great aunt. The stones for the church were brought up by slaves from the Spring Bay, where they had been part of the building of a sugar plantation. Lime was used in those days in building up the walls, and because of that the salt in the lime is still a reason for having to paint the church quite often. In 1877 the Church of the Sacred Heart was built in The Bottom. Its present building in The Bottom is the third one and dates from 1934. In 1911 the Church of the Holy Rosary was established in Hell’s Gate, and its first wooden structure was replaced by the present one in 1962. The work of the Roman Catholics was not without success. In 1878, 35 years after Sarah Mardenborough had begun her work, Saba had about 600 Roman Catholics. Some of the well-known priests on Saba in the early history of the church were; Father Josephus Philip Thomas Kock born 29 August 1823 and died 19 August 1890. He served here 24 years and is buried in the vault next to the church in Windwardside, as well as Father Laurentius Mulder (b. 28 August 1843 died 3 August 1916). He served 25 years. 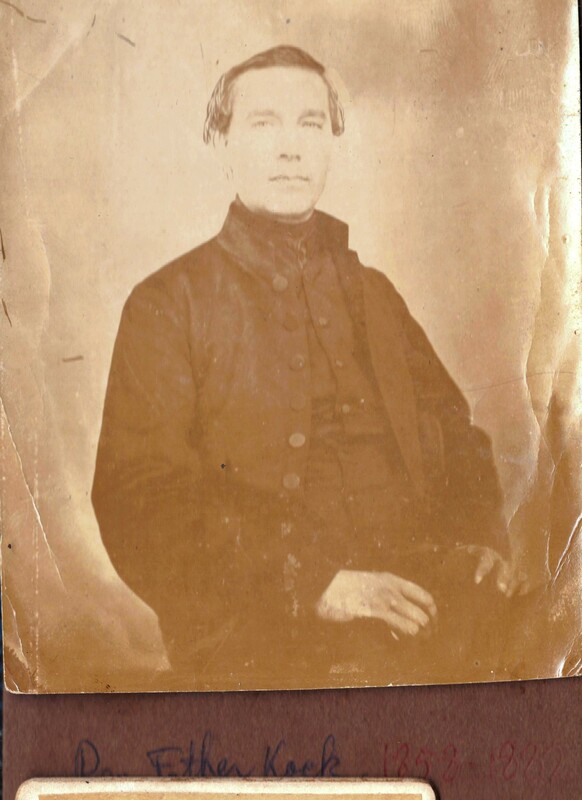 Father J. Kock served for many years as the first real resident R.C. priest on Saba. He was a Jesuit priest and is buried in the vault of the Hassell family next to the church in Windwardside. 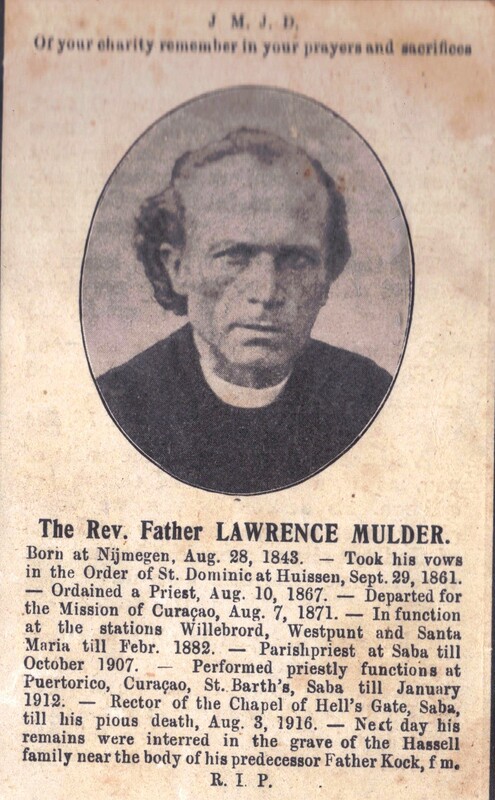 Later on Father Lawrence Mulder was buried in the same vault. Father Niewenhuis also served for 28 years, and Father Norbertus Matthias Joannes Petrus de Groen (b. 16 Aug. 1879 and died 1944) served on Saba for 21 years. The first church in Hell’s Gate was the work of Father de Groen. He was an old salt with wrinkled brow and rough hands. He was equally at home handling the rudder of the vessel he sailed from island to island as that of the vessel of St. Peter, or the reins of the horse on which he climbed the steep roads of Saba. 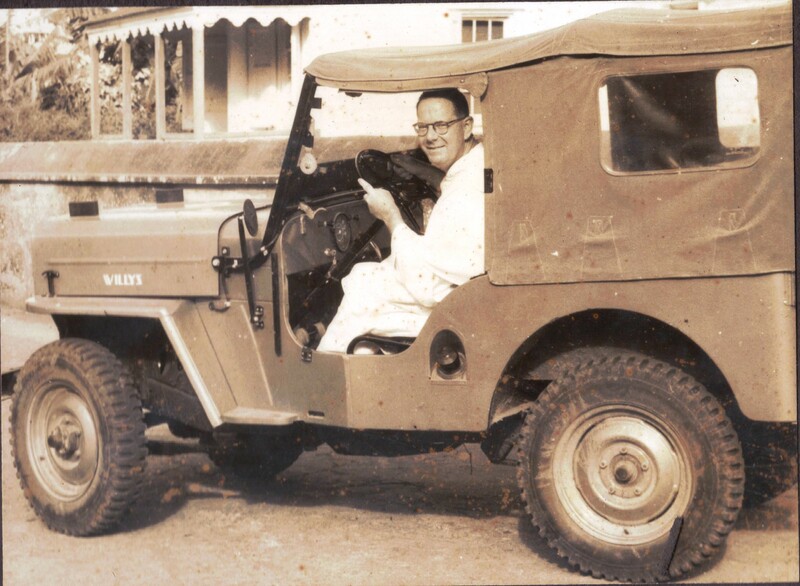 Father Boradori in his Jeep driving through Windwardside. He is buried in the cemetery in Windwardside. There are four priests buried on Saba. In The Bottom, Father Anton Jansen who died a few years ago, and in Windwardside, Fathers Kock, Mulder, and Boradori. The latter was felled by a massive heart attack while giving Mass in the church at Windwardside and died on the altar with a full church praying in attendance. The first Saban Roman Catholic priest to be ordained is the well-known Father Simon Wilson who became a priest on July 4th, 1980. The ceremony took place in the Church in The Bottom in the presence of Bishop Msgr. Wim Ellis, Father Alphie Heyliger of Statia, Father G. Bisschop and the family and friends of the Wilson family from many of the Caribbean islands. The church was also involved with our schools. In 1907 the Reverend Sisters of the Dominican Order arrived here from Holland. On October 1st 1907 the school was recognized by the Government. In 1908 a small convent was built behind the Rectory at Windwardside which building still exists. 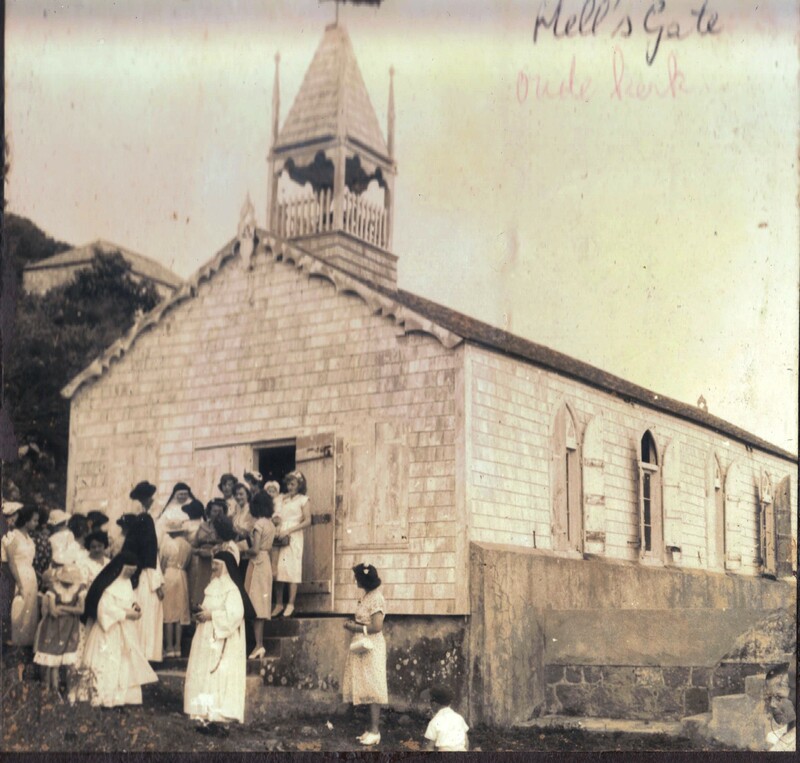 In 1911 the new school was opened in Windwardside which building is still in use as a Parish-Hall. In 1925 the present Rectory in Windwardside was completed and in 1955 the new school opened in Windwardside which is now used as the Eugenius Johnson community centre. The old wooden church in The Bottom torn off its foundation in the cyclone of September 26th, 1932. With Saba manpower and the Marines suppling jacks for lift the building was placed back on its foundation and served as a school after the new stone church was dedicated on March 19th, 1935. I used to go to the 6th and 7th grade in this school (1953 and 1954). Later on a modern cement constructed school was built on this location around 1957. It also served as the Saba School of Medicine when it was starting up. The period of Dominican Nuns and Priests came to an end in the nineteen seventies. The only interest the Dutch seem to have in religion nowadays is to wage a Don Quixote style war against other religions like the devout Muslims, but very few Dutch people go to church or even believe in Christ anymore if the truth be told. The last years the church on Saba is being served by priests from the Philippines, the present priest being Father Dan Pastor.As this article is being written a Dutch priest Father Alphonsius Baak is taking the place of Father Dan who is undergoing medical treatment. I have a large number of photo’s pertaining to the church. I will post this article for now but will correct it later on. In my large collection of photo’s I know I have one or mother of our own Father Simon Wilson which when I come across it I will attach to the article as well. And a wish expressed in 1848 by the later Bishop Father Niewindt to the papal nuncio in Trinidad was realized in the nineteen seventies. Niewindt had asked to send some religious English speaking nuns to Saba. Nothing came of it. However when the Dominican Nuns left Saba in the nineteen seventies, Father Jansen was able to convince the Living Water Community of Trinidad later on to send people to Saba for the same purpose and they have been serving Saba and St. Eustatius these past years. And it would seem that the old antagonisms between the different faiths have been healed and there are harmonious relations between the different faiths. May it continue to be so!